"Easy recipe that tastes like you cooked all day. 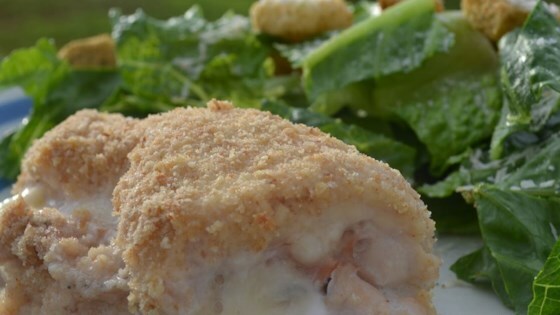 Chicken breasts are wrapped around ham and mozzarella cheese for a change in this version of the classic baked dish." Lay out the pounded chicken breasts on a clean surface. Place a slice of ham on each piece, then one stick of cheese. Roll the chicken up around the cheese and ham, and secure with toothpicks. Dip each roll in melted butter, then roll in bread crumbs. Place in a shallow baking dish. Bake for 40 minutes in the preheated oven, or until chicken is browned and juices run clear. Good recipe simple directions to follow. My only advice is to incorporate a sauce otherwise its a little on the dry side. This was amazingly good!! !I followed the recipe exactly except I used Swiss cheese instead of mozzerella.Sooo tasty!It is messy trying to take out the toothpicks, but worth it!